Deemed a National Artist in 1998, Prayat Pongdam was a Thai printmaker. Pongdam’s studies in painting began under the tutelage of Prof. Silpa Bhirasri at Silpakorn University. Pongdam continued his education at the Academia di Belle Arti di Roma in Italy in 1961. 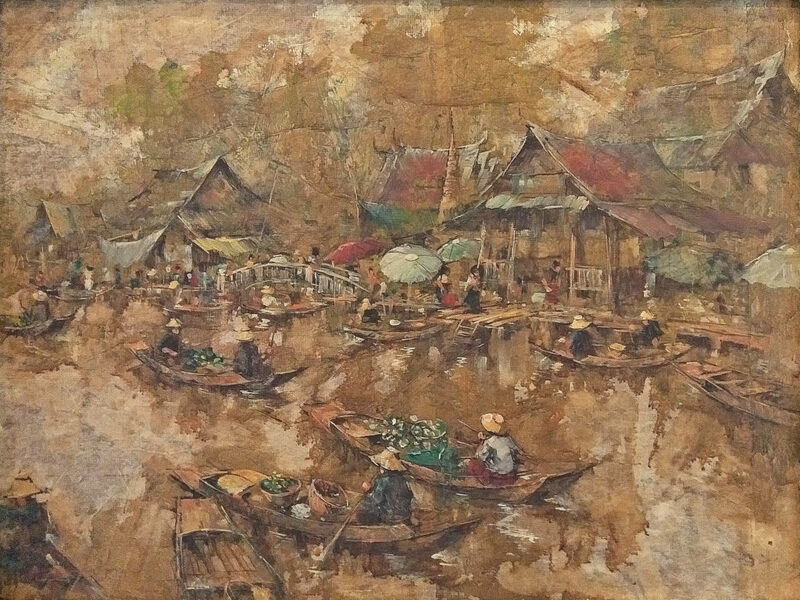 Upon returning to Thailand, he regularly created paintings and prints, and was among the first in a group of Thai artists to introduce printmaking techniques to the public. He was declared an artist of distinction for his printmaking in 1981, and was awarded the title Academico Onorario Classe Incisione from the Italian government through the L’Accademia Florentina delle Arte del Disegno. His artworks explored ideas of nature, ways of life, and the Thai rural spirit through simple human and animal symbols expressing themes of warmth, affection, and love. Usually foregrounding his paintings with animal subjects, his backgrounds consisted of landscapes such as temples, churches, vihara, heritage sites, local villages, fields of rice, gardens, and forests.